Maria Rusafova and Jakub Markulis’ home seems to float in the woods. From one angle, the towering red oaks and maples thriving just inches from the structure appear to lift the cube into the canopy with their trunks and elbowy limbs. Steel, rich with a mottled patina of rust, wraps the exterior and frames soaring windows that reach 35 feet into the sky. This modern, West Asheville home sparks the imagination, just as the owners do themselves. The two architects, who designed the home themselves, exude unpretentious creativity. Maria’s paintings adorn the walls of Asheville restaurant hot spot, Rezaz, and Jakub dabbles in music, playing acoustic guitar and drums. Maria is originally from Bulgaria, Jakub from Poland, and the two met as architecture students at the University of Tennessee in Knoxville. Eventually they married, and landed their current jobs at local firms; Maria works with PBC+L Architecture, while Jakub works at Fisher Architects. Along the way, though, they fit in enough time to design and build a home they felt would could rise in an urban forest, with a minimal amount of disturbance to the environment. It was a long—make that long—process, the two explain with a laugh. “We didn’t know exactly what kind of house we would even build,” Jakub says. Maria’s brother purchased three adjoining lots here more than 10 years ago, but ended up selling two of them to the neighborhood so the property wouldn’t be developed. When he gave the remaining parcel to the couple, they recognized the opportunity to build a unique dwelling, one that, at first, raised some eyebrows in this neighborhood dominated by bungalows and ranch-style homes. But they decided the modern design would suit the sloped site, which is populated with mature hardwoods and bordered by a creek. “The general agreement was that we wanted something very modern,” Jakub adds. “We wanted a low-impact house that was perched on some sort of structure. If we took a traditional approach, we couldn’t build on the site.” Nor could they save the trees. “The moment we cut the trees, we knew we would have a very different house,” Maria adds. So they did what Maria says is typical in Bulgaria—they built as they had the money and time to work. The two collaborated easily, sharing the design duties and participating in the construction. “It was very interesting to work together, because it was our first joint project design-wise,” Maria explains. And as the work progressed, so did their vision of the outcome. “We just kept changing things, even as it was being built,” she says. Maria was five months pregnant with their first child when they broke ground, and five years later—after moving in mid-way through the construction, and counting on a lot of help from her father and brother—the home was finished. Today, they share this home that embodies minimalist, custom-made European styling with their son and daughter. Commercial floor-to-ceiling, corner windows, sliding wall panels, and an oak-and-steel stairway give the home its modern, light-filled edge. The small entryway leads into a large, open room that includes the kitchen. Because the home is only 1,440 square feet, creative storage was a must, the couple says. Tall cabinets flank the long galley kitchen that features over-counter windows. Coupled with custom-made walnut doors, the cabinets hold everything from Maria’s yoga mats to six-year-old Boryan and four-year-old Raina’s art supplies, all within easy reach of the farmhouse dining table they picked up at a local antique mall. For additional storage, they lined the upstairs hallway with aluminum-and-glass Ikea cabinets. The living area holds shelves stuffed with books written in Bulgarian, Polish, and English, as well as rocks Boryan has collected on the family’s many walks together. A blank canvas adorns one wall; Maria says she may get around to painting it one day, but even naked it complements the sleek, white linen sofa and chairs in the room. 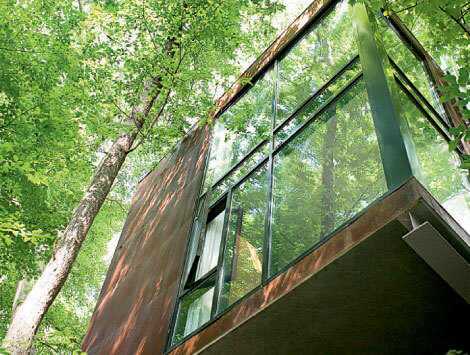 One corner is virtually made of windows that span the height of the home, revealing an engulfing view of the forest. Because the unpainted plaster walls are largely unadorned, the view becomes the home’s showpiece. “We wanted it to feel open and connected to the light,” Maria explains. Upstairs, the office area, which overlooks the living room, holds a kid-size red drum kit Jakub and the children play. Down the hall is the home’s main bathroom, where dark slate covers the floor and a skylight pumps light into the shower tiled with sea-colored glass squares. But edited doesn’t mean stark. The kids have made the house a lively place. Their shared room is filled with beloved stuffed bears, drawers full of Legos, and shelves stocked with board games. Maps of the United States and China share wall space with Boryan’s monkey puppet and drawings. Even Raina’s scribbled figures on cabinets and doors—in permanent marker—are beloved pieces of artwork. Contact Home Editor Angie Newsome at homes@wncmagazine.com.